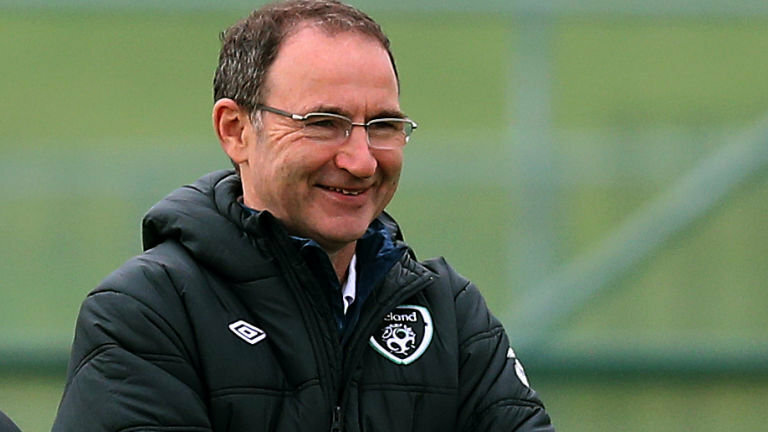 Home European Football Irish Football What Now For O’Neill ? Last October the Republic of Ireland manager verbally agreed a new contract with his present employers. If you look back at what he has achieved since taking over the top you would have to be happy with his achievements. He has not had a huge pool of top quality players to call on and what he has done in my opinion deserved the offer of a new contract. The style of football has not been something to get you off your seats and do a Morris dance, but to get to the play offs from a very difficult World Cup qualifying group was an achievement in itself. The game against Denmark was a disaster as I have written about before and O’ Neill was caught out tactically. It was a night when a plan B was non existent, in fact did Ireland even have a plan B. So with that campaign over it is time to prepare for the next challenge and finally get pen to paper on that contract. Yet what has happened over the past two weeks has thrown all the plans for the future up in the air and has left a few questions to be answered. When Stoke City sacked Mark Hughes the worry was that Martin would be approached to takeover at the Premier League club in some sort of capacity. The fact that his proposed contract with the FAI had not been signed, left the door wide open for Stoke to make an approach and they duly did. The FAI were not in any position to refuse Stoke permission to talk to Martin as technically he was not their employee. It showed a massive error of judgement by the top brass within the corridors of Irish football not to have had everything signed and sealed after the Denmark game. A lot of the Irish fans are of the opinion that it was downright bad management. In the end Martin turned down the offer from Stoke but it has left a very bad feeling between the man from Derry and most Irish fans. It leaves huge questions over his Irish future and in fact his commitment to the Irish cause. The very fact he sat down with Stoke for talks and discussed becoming their manager highlighted the fact that if a better club or offer had come along he would have been off and left the Republic of Ireland in a mess. It will be very interesting to see how Martin explains his decision when he next sits down with the Irish media and more importantly has he done himself unrepairable damage with the fans. The next two Ireland games are away from home against France and Turkey in friendlies and he is a very lucky man these games are away from Dublin, as I feel he would have come up against a very hostile reception from the fans if these games had been played in the Aviva Stadium in Dublin. When all these shenanigans were going on I watched social media for the fans reaction and a lot of the Irish fans wanted him gone and in some cases lads were prepared to drive him to Stoke. Martin now has a huge job ahead of him not only to start getting winning results but to also repair the damage he has done between himself and the Irish fans. The FAI have also got to look seriously at themselves, to leave a contract unsigned and still on the table was inexcusable and could have exploded in their faces. As we move on now to qualification for the 2020 European Championships it will be very interesting to see if Martin stays on as Irish boss or will the fans have ran him out of town. Celtic to Take on Old Foes.